I’d like to start by thanking the author for asking me if I’d be interested in reading her book. I haven’t read anything by her previously but had read very good reviews of her last novel, Brake Failure, so accepted her kind offer. Today is publication day and if you like the sound of the book, you can order a copy online here: Zenka. At the time of writing this, it is only 99p for Kindle. Now I have to be honest and say I really wasn’t sure if I would like this book but bloggers I respect, such as Anne Williams at Being Anne, always spoke so highly of Alison’s writing that I agreed to give it a go. I said to Alison that if it wasn’t for me I would be honest and tell her and she could perhaps write a guest post instead. After all a book featuring a pole dancer, gangsters and guns is most certainly not my usual kind of read! But as you can tell, since you are reading a review, I was surprised to find myself enjoying it! Alison Brodie has created some very memorable larger than life characters not just in Zenka (whose letters home made me laugh!) but also in mob leader Jack and his son, the hapless Nicholas who couldn’t be more different from Jack if he tried. There is a lot of sharp, witty dialogue throughout and plenty situations throughout the book where the term black humour can aptly be applied! 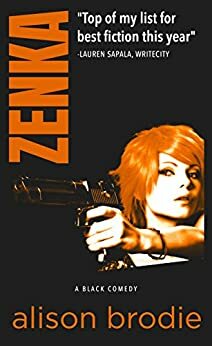 ZENKA will is released on 6 Nov, 2017. Thanks for the mention Joanne 😊. Alison is a superb writer – and you’re right, I really loved this one!